Genes required for viability are called essential genes. Essential genes can sometime become dispensable upon genetic alterations, but to what extent and how such essentiality loss can occur have been unclear. Our paper in Nature Communications systematically investigates “bypass of essentiality (BOE)”, a type of digenic interaction that renders essential genes dispensable, and reveals a surprisingly high prevalence of bypassable gene essentiality. Our paper “Systematic analysis reveals the prevalence and principles of bypassable gene essentiality” can be found here. My history with bypassable gene essentiality can actually be traced back to 20 years ago. During my PhD training, I studied an essential gene called PAG1 in the budding yeast Saccharomyces cerevisiae. To gain genetic clues on its function, I searched for suppressors of its mutants, and identified loss-of-function mutations of one gene (SSD1) and overexpression of another gene (SIM1) as suppressors that can rescue the lethality of deleting PAG1 (Du and Novick, 2002). This experience planted a seed in the back of my mind. A few years later, after studying DNA damage response in the fission yeast Schizosaccharomyces pombe as a postdoc, I set up my own laboratory at the National Institute of Biological Sciences (NIBS) in Beijing, China. In 2009, my interest in essentiality bypass was rekindled by reading a paper where bypass suppressors provided spectacular insights into the function of the acetyltransferase Eco1 in S. cerevisiae (Rolef Ben-Shahar et al., 2008). Together with a first-year PhD student, Jun Li, and a technician, Jing-Yi Ren, I began methodology development for essentiality bypass analysis in S. pombe. I selected the essential gene eso1, ortholog of S. cerevisiae ECO1, as the proof-of-principle gene for suppressor screening. At the time, Jun Li was developing a piggyBac (PB) transposon-based mutagenesis method (Li et al., 2011), which became our tool of choice for inducing suppressor mutations. In October 2010, we were able to establish a screening procedure by using strains in which the only copy of an essential gene is on a counter-selectable episomal plasmid (Picture 1). We call such strains “query strains”. This method worked very well for eso1, as dozens of independent eso1-bypassed clones can be obtained on a single plate (Picture 2). We decided to apply this method to examine how many other essential genes can be converted to non-essential genes by suppressors. We term this type of suppression genetic interaction “bypass of essentiality (BOE)”, and name the transposon-based screening procedure “T-BOE”. Picture 1. Diagram of T-BOE screening procedure using the bypass of eso1 by PB insertion of pds5 as an example. TK is a marker that can be counter-selected using the drug FUdR. 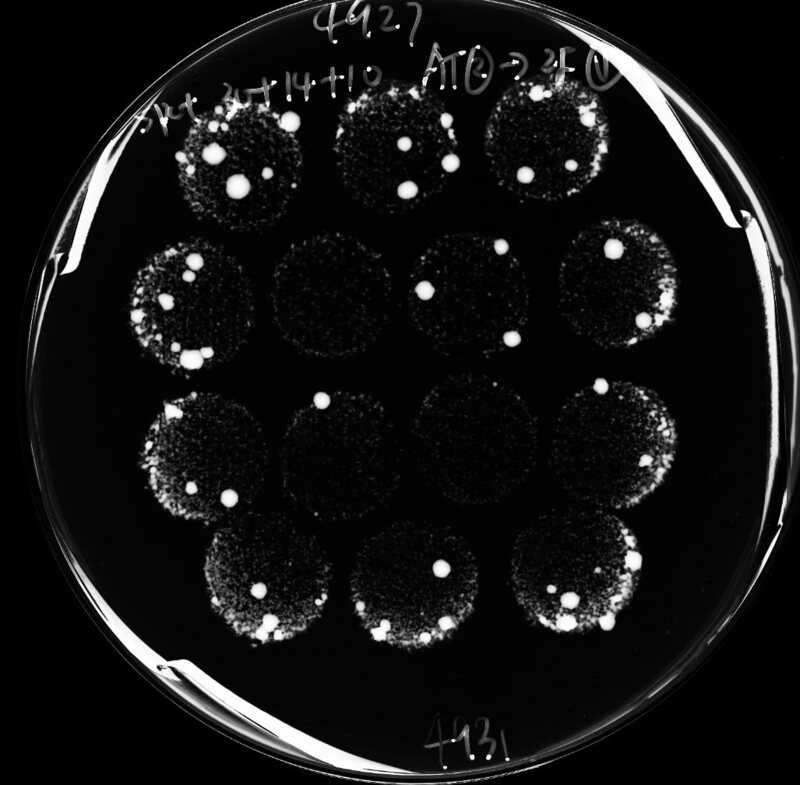 ade6 is a colony color marker whose loss results in colonies turning red on low-adenine media. Picture 2. Image of a plate selecting for T-BOE suppressors of eso1. The road to success is never smooth and easy. Unlike the situation with eso1, we encountered repeated failures when constructing query strains for some of the other essential genes chosen for pilot testing. Through trial and error, Jun Li discovered that placing another selection marker, the S. cerevisiae LEU2 gene, between the ade6 marker and the essential gene on the plasmid boosted the success rate of query strain construction. He also found an efficient way to verify that the plasmid did not inadvertently integrate into chromosomes. In March 2012, the query strain construction method was finally robust enough for large-scale applications. In 2011 and 2012, respectively, two more PhD students, Hai-Tao Wang and Wei-Tao Wang, joined the BOE project (Picture 3). To expand the suppressor coverage, in addition to T-BOE, we developed chemical-mutagen-based screening procedure (C-BOE) (Picture 4) and overexpression-plasmid-based screening procedure (OP-BOE). We also established procedures that validate BOE interactions independently of the original screening results. To systematically analyze BOE interactions, we set our aim on a large and unbiased set of essential genes: the essential genes on the left arm of chromosome II, representing about 13% of the essential genes in fission yeast. Picture 3. 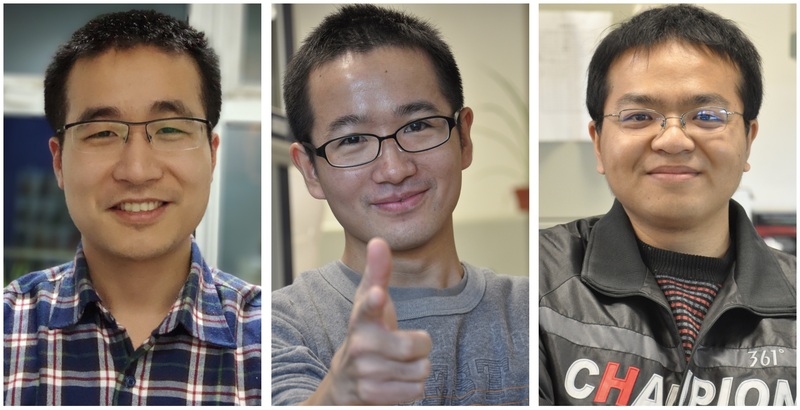 The three co-first authors of the paper (left to right): Jun Li, Hai-Tao Wang, and Wei-Tao Wang. Picture 4. Image of part of a plate selecting for C-BOE suppressors of the essential gene rhb1. 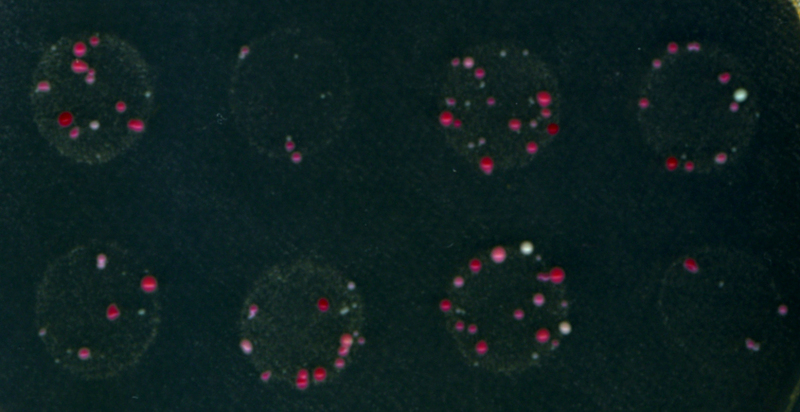 Red colonies are rhb1-bypassed clones that have lost the counter-selectable plasmid, and white colonies are clones with the counter-selectable marker mutated. It took us more than three years to complete the screening and verification work. We were able to identify and verify 263 BOE interactions that render 38 (27%) of 142 essential genes dispensable. 99% of these interactions are novel. The bioinformatic and statistical analyses of this large dataset—mainly undertaken by Jun Li, who had become a postdoc in the lab—took two more years, and writing up the manuscript, which is unlike any manuscript I had been involved with before, was also a challenging process. In the end, I believe that this long and arduous pursuit is worthwhile and we have made a valuable contribution to the understanding of a fundamental aspect of the genetic wiring of living systems. Du, L.-L., and Novick, P. (2002). Pag1p, a novel protein associated with protein kinase Cbk1p, is required for cell morphogenesis and proliferation in Saccharomyces cerevisiae. Mol. Biol. Cell 13, 503–514. 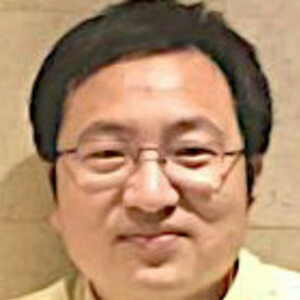 Li, J., Zhang, J.-M., Li, X., Suo, F., Zhang, M.-J., Hou, W., Han, J., and Du, L.-L. (2011). 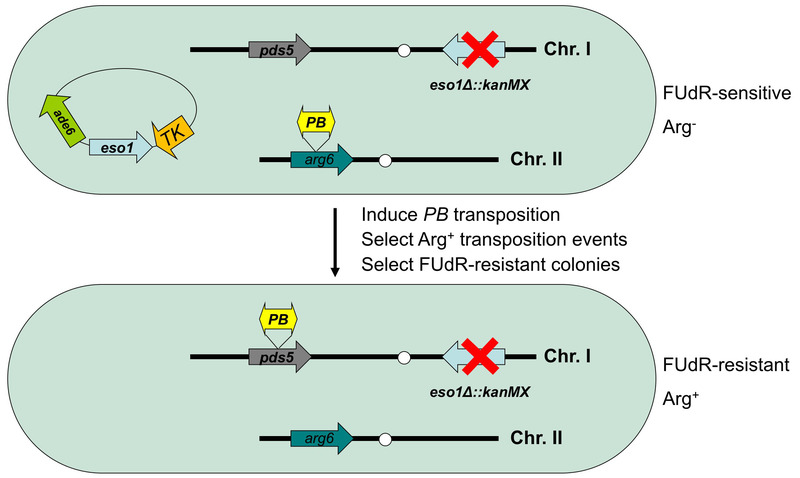 A piggyBac transposon-based mutagenesis system for the fission yeast Schizosaccharomyces pombe. Nucleic Acids Res. 39, e40. Rolef Ben-Shahar, T., Heeger, S., Lehane, C., East, P., Flynn, H., Skehel, M., and Uhlmann, F. (2008). Eco1-dependent cohesin acetylation during establishment of sister chromatid cohesion. Science 321, 563–566. My laboratory uses the fission yeast as a model to study genome evolution, genetic networks, autophagy, and genome integrity maintenance. We are also keen on developing and implementing new technologies to further enhance the power of fission yeast research. I read your paper with great interest. I have been interested in this question for a long long time and pursued that question in a similar manner using budding yeast for several years, but we failed in the end (I will spare you all the gory details). But the question never left my mind. I also wrote a blog at this very site, giving additional historical background that led us to where we are.